Whenever I think of a calendar year, I see it in my mind's eye as a clock with each of the months around it like the numbers that we use to tell the time. December and January are both at the top, separated by the stroke of midnight, and here we are again, only a few ticks away from the old year ending and the new one starting. This New Year, I have decided, will be on one of looking back as much as forward; of appreciating what I have rather than always looking to see what I want next. We can be so driven sometimes, always working on the next project, planning the next adventure, that we forget that we already have so much of what we strive for right at our feet. 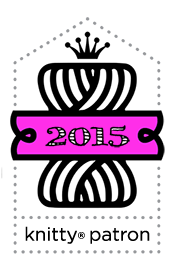 And why wait until next year to do this when I can start now by looking back at 2018? So what was 2018 all about for me? Oh socks, of course! 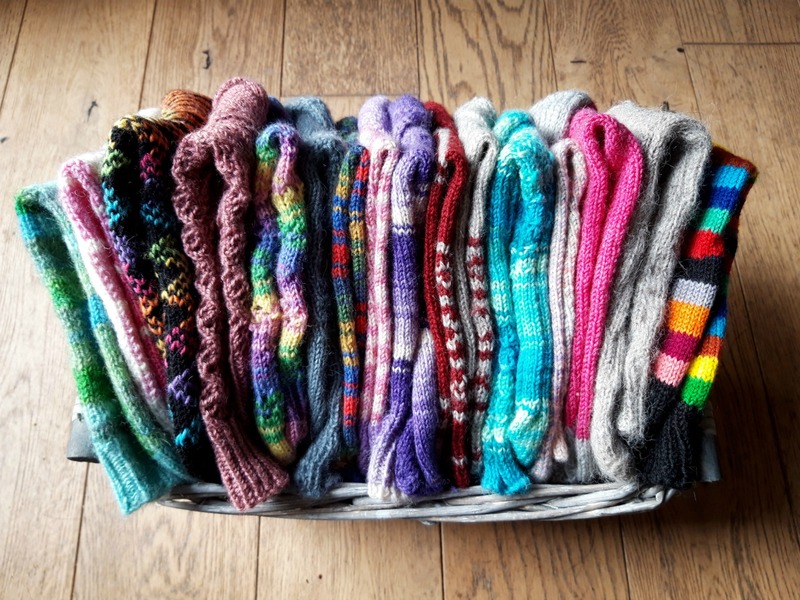 It wasn't until I was prompted to count up how many pairs I'd knitted this year that I realised just how much a part of my life socks are now. I don't even think about it; they're as much a part of me as eating or sleeping. There's at least one pair on my needles all the time (I currently have 4 WIPs which is quite a low number for me, but a good thing as I intended to start next year by doing some finishing off!) and I will knit my socks pretty much every day. Knitting those rhythmic rounds is what keeps me grounded; they bring me comfort and stability during tough times and they make me happy, releasing feel-good hormones as I make my down those familiar neural pathways. Picking up my needles is like coming home, and I don't ever intend to stop. 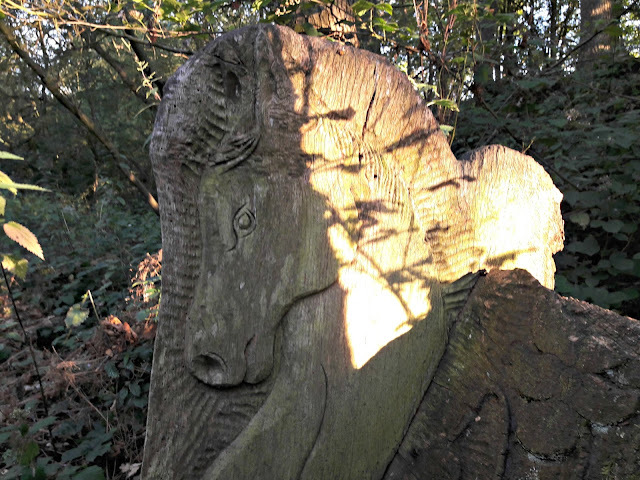 If you're in the Peak District over the Christmas period, you might well be tempted to follow the Peak District Yarn Trail (although do check opening hours before you visit!) 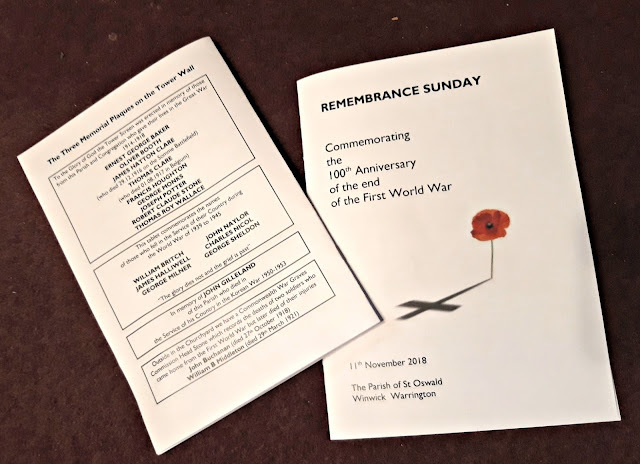 - you might remember that in early November I went to Peak District Yarns in Tideswell ... a couple of weeks later I went to Wiseheart Studio in Whaley Bridge as Kate, Martyn and Annie who own the Studio were celebrating their 2nd Studio birthday. It was another cold day (I was glad I'd put lots of layers on!) 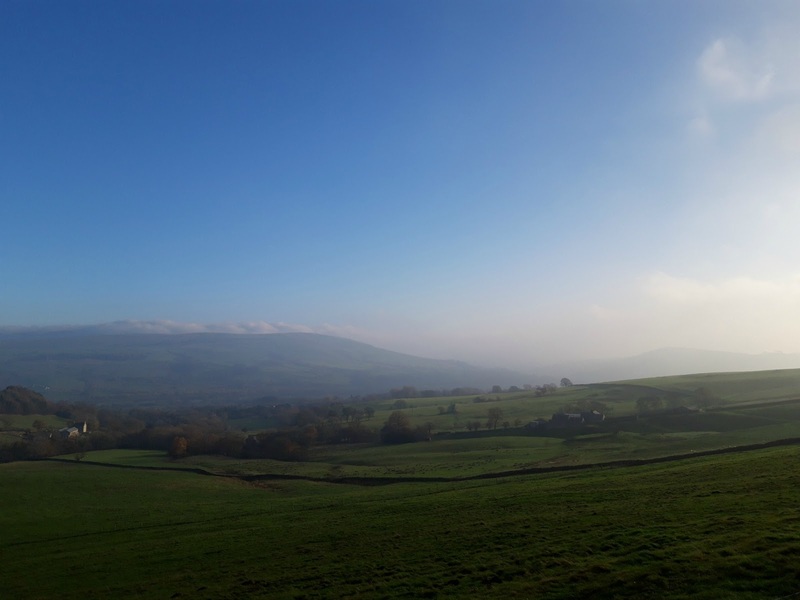 but the winter sun lit up the hills as I drove past Manchester Airport and out into the countryside. Whenever I click the "publish" button on the Yarndale Sock Line request post, there's always a moment where I catch my breath - and then exhale again, knowing that the post is out there and whatever will happen next, will happen next. 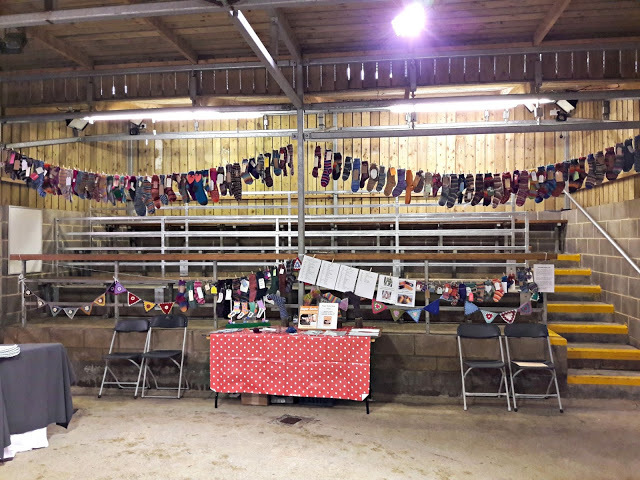 There are so many demands on our time, on our budgets, so many deserving charities that want us to use our skills to help them ... every year, I try not to worry that my pair of socks will be the only ones hanging in the Auction Mart, and every year my fears have been unfounded. Thank you. 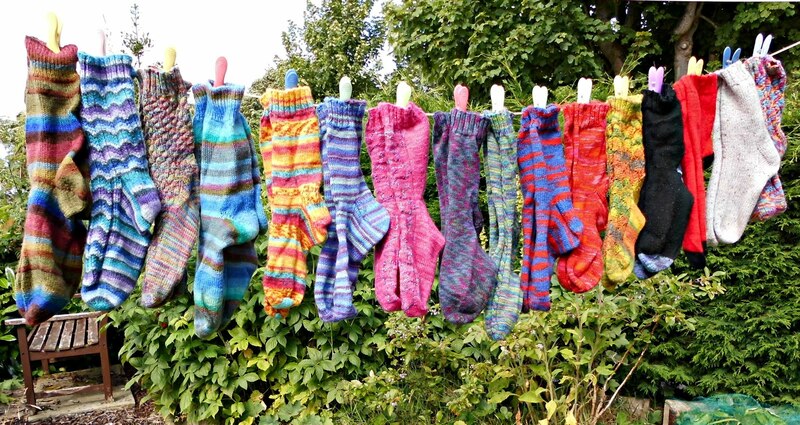 The generosity of the crafting community - and especially the sock knitting community - never fails to bring a tear to my eye. I am walking with the dog to the post box to re-post a Christmas card that was wrongly delivered to us. It’s dark, it’s raining, I’ve forgotten my mittens and my hands are freezing. The dog is oblivious to the dark, the cold and the rain and feels that it is his duty to minutely inspect and sniff every bush and lamp post we pass by. Oh, come on! It’s going to take us forever to get there at this rate! It’s ten days till Christmas Day. I’ve got cards to write, presents to wrap, (dare I admit it?) presents still to buy, cooking, cleaning, tidying still to do and the last place that I want to be is out in the dark, empty streets when there are a hundred and one other jobs that I should be doing instead. We cross the road and walk down one of the streets where the houses and their gardens are lit up with lights and Christmas decorations. It looks lovely but I’m not feeling remotely festive. I’m feeling cold and grumpy. The dog has stopped again. Oh, come on! I can see the post box from where I am standing but feel like I’m never going to get there because the dog is now trying to get under someone’s hedge. Has he no sense of urgency? Hellooo! 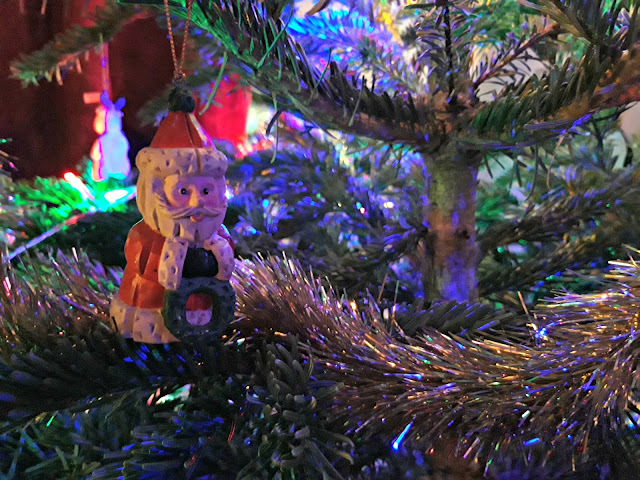 I'm just dipping in to say a quick hello before I rush off again - I don't know about you but at this time of year, it feels as if everything is suddenly gaining speed and hurtling towards Christmas at a great rate of knots - and it's not even December! It's been a full moon this week and some people do think that makes the world (and it's inhabitants) a little crazy - what do you think? Whether it's the moon or not, I think it must also be something to do with the shorter nights - by the time it reaches 4.30pm and it's pretty much dark, I'm wanting to snuggle up by the fire with my knitting, never mind make dinner and get on with jobs! It's been wet and miserable here over the last couple of days, too, which hasn't helped, and my Instagram feed is full of the snow over in Canada which looks so lovely even though I know that such early snow is making life difficult. It just looks so much prettier than the rain battering against the windows! 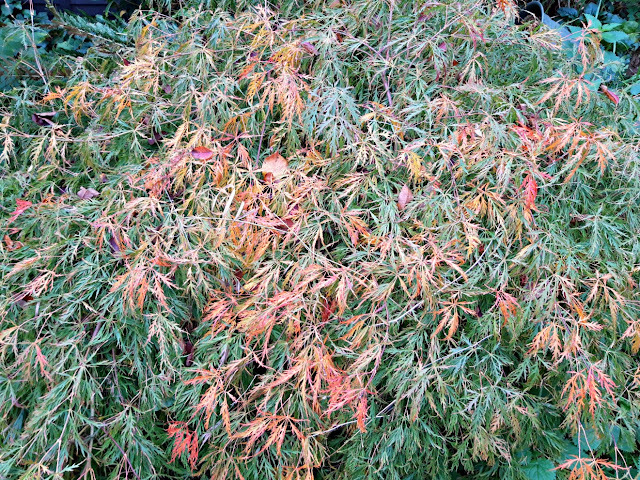 Small daughter and I were walking the dog and she’d picked a large leaf blown down by the Autumn winds. 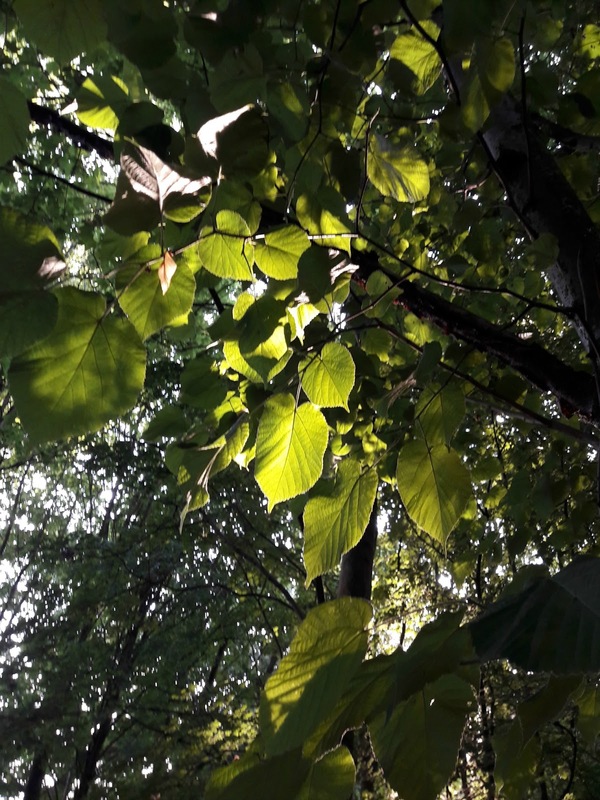 Because I’ve spent years as a parent answering questions, it didn’t occur to her that I wouldn’t know – but in this case I actually did (it was from a horse chestnut tree). 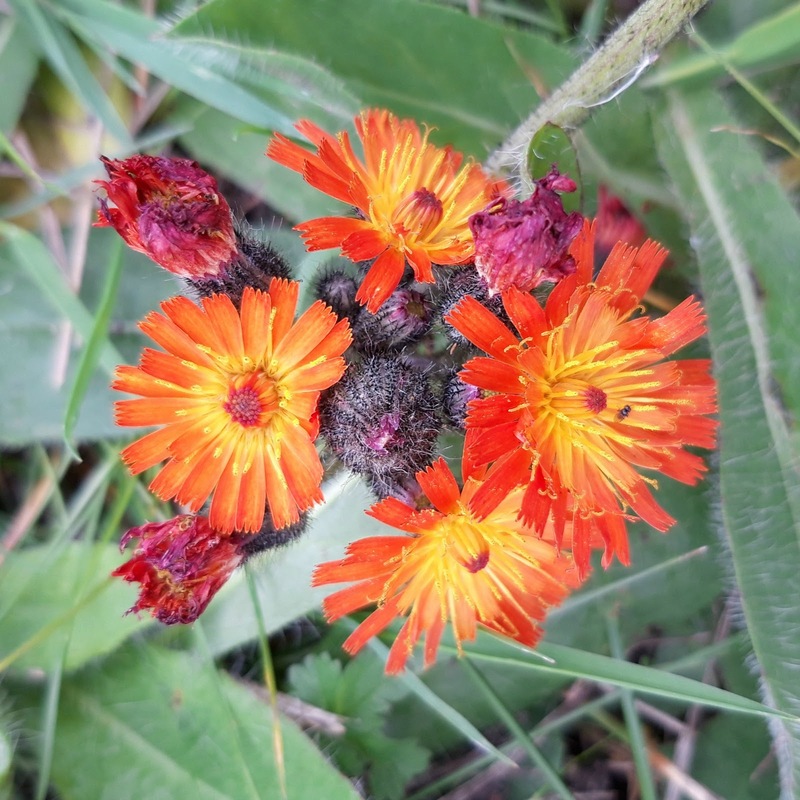 From being young, I’ve always been interested in nature and have more than a few books to help me identify trees, wildflowers and animals that aren’t generally found in the garden. It might be easier to look things up on the internet these days and I do that too, but I still love my books. 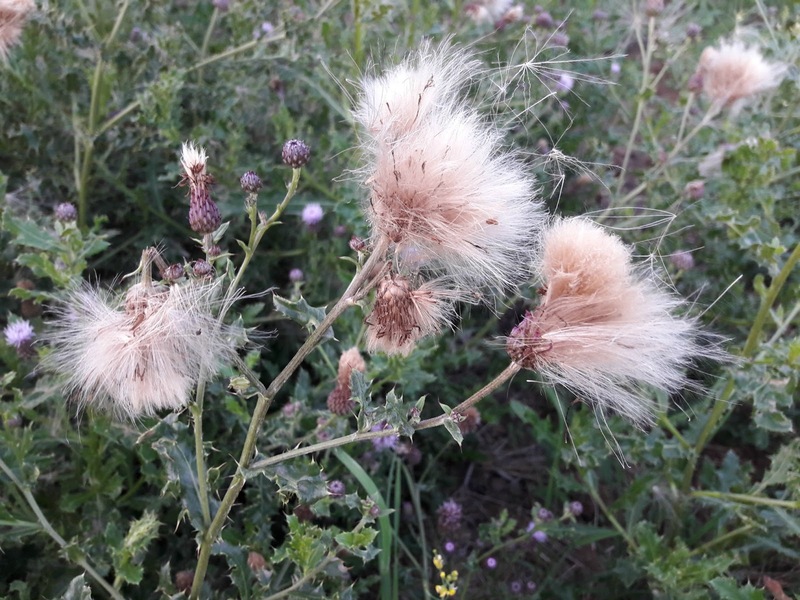 Despite my best efforts, neither of my girls have been particularly interested in naming the trees and flowers that we’ve passed on our walks over the years and this latest conversation with small daughter had me wondering why. Is it because they’ve always known that I’ll have answer so they’ve not needed to (although often we’ve had to look something up when we got home), or perhaps they don’t have the time as there are so many more things to capture their attention – gone are the days when children’s TV was only on for an hour a day and after that you had to make your own entertainment – or maybe they are just not that bothered about it? I’ve learnt not to worry too much about it as a lack of interest at a young age doesn’t mean that you won’t become interested later. 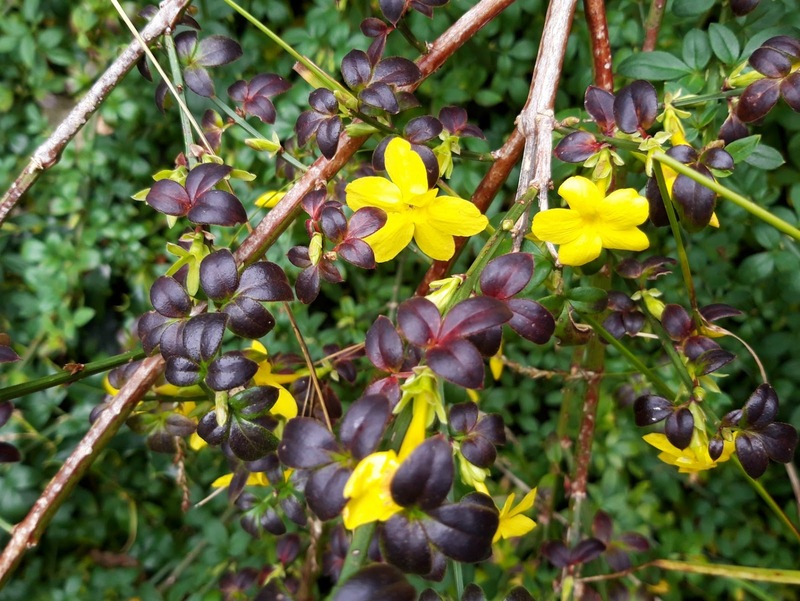 I re-trained as a gardener after big daughter had gone to school, fascinated by the same Latin names and soil structure information that would have left me cold only a few years earlier. It’s never too late to learn something new. The way it turned out, I ended up doing things last weekend that were completely different to what I had planned to do. It just works out that way sometimes, doesn't it? 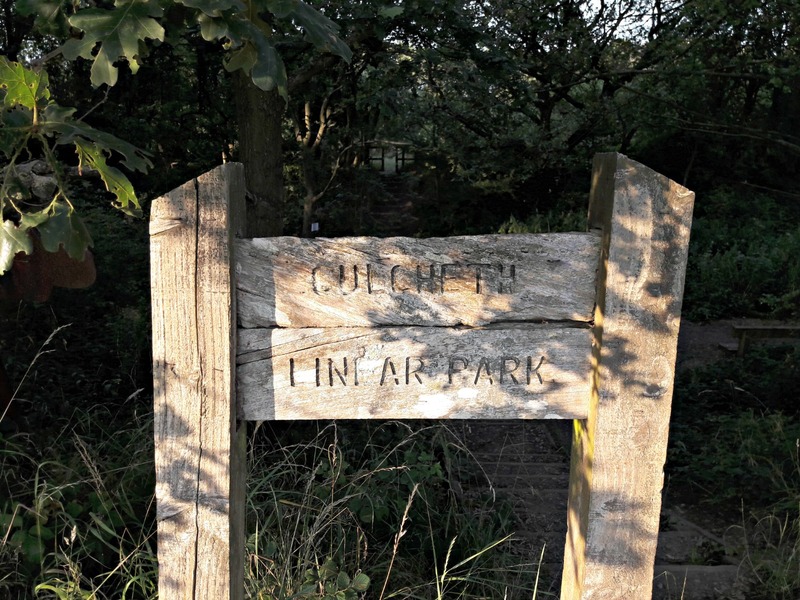 Culcheth Linear Park is just lovely at this time of year. The leaves have been spectacularly gorgeous and are lying inches deep on the path. It's like walking through crunchy snow! 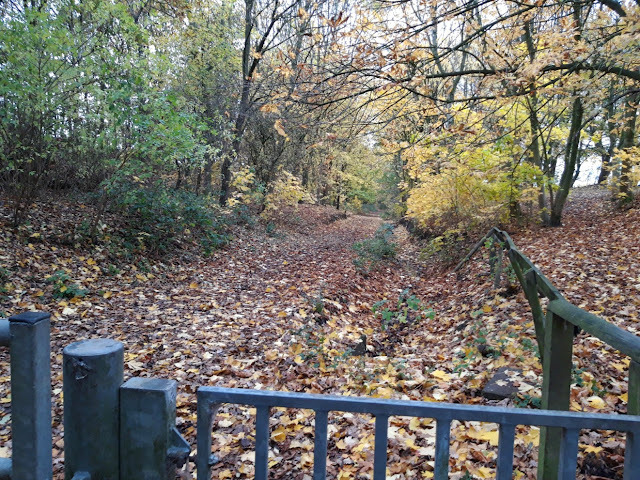 The dog doesn't really like leaves which is quite strange - he'll do his best to walk around them if we're walking on pavements - but he's always distracted by the interesting smells on these walks so I don't worry too much about bringing him. what matters is so much more than can be said." You might not guess from these pictures but it was actually quite a bright morning on Saturday when I left Winwick to drive over to Tideswell in the Peak District to visit Peak District Yarns! 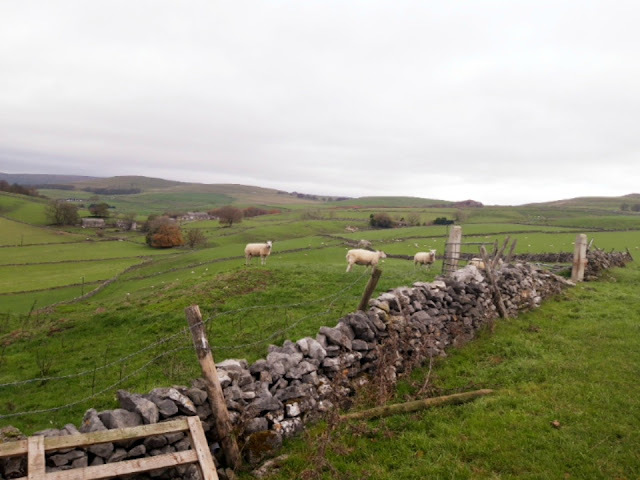 As the road snaked higher and higher, so the cloud got lower and lower and by the time I stopped to take a quite photo of these sheep (there's always got to be a photo of sheep! ), it was looking quite dull. 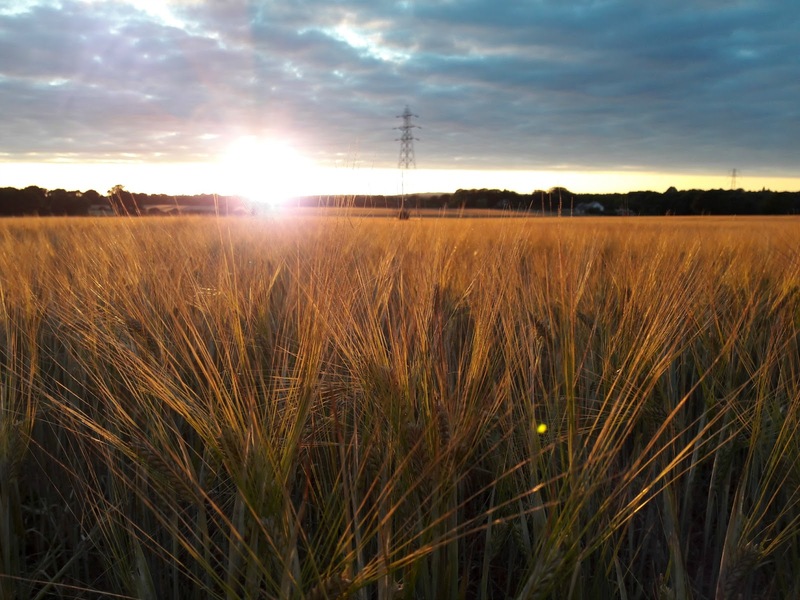 Not so dull that you couldn't see fields as far as the horizon, though. It's a lovely drive and Tideswell isn't as far off the beaten track as you might expect as you pass sheep, cows, farms and more sheep, leaving the towns and suburbs miles behind. Wednesday night was Hallowe'en or Samhain (pronounced Sah-win) if you're more of the Celtic persuasion, a night when belief has it that the boundary between our world and the next can be more easily crossed, and according to Celtic tradition, a time that is half way between the Autumn and Winter solstices which marks an end to harvest and the beginning of Winter. 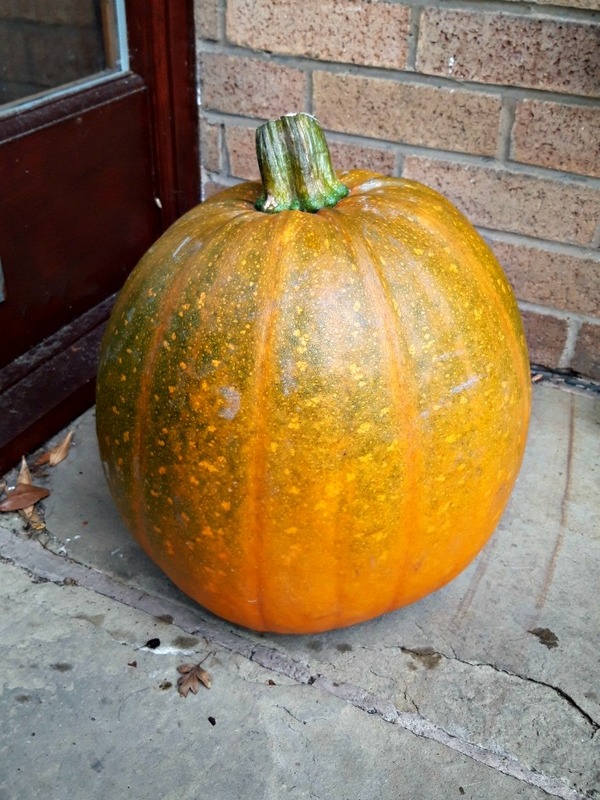 For small daughter, this means pumpkins, dressing up and collecting her own bodyweight in sweeties. I'm not so keen on the modern traditions that go with Hallowe'en although I really enjoyed Hallowe'en as a child. 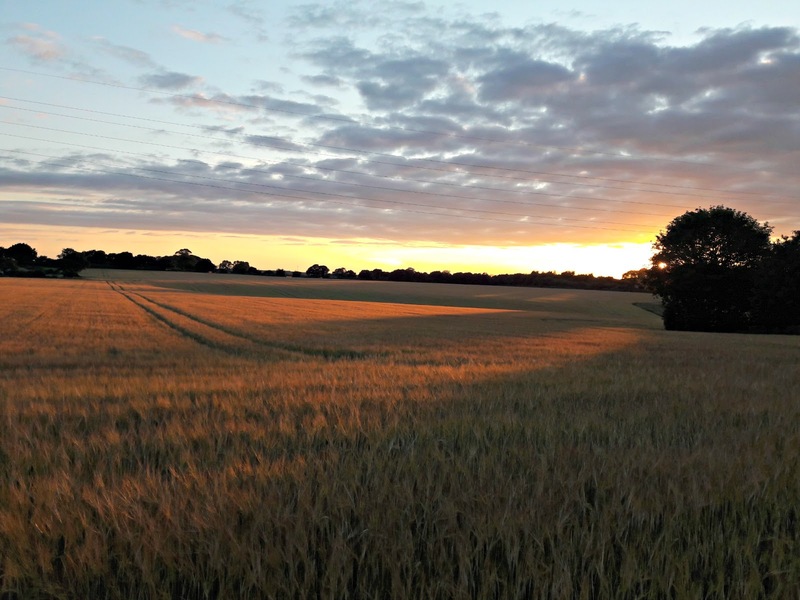 I can remember bobbing for apples and running round the garden trying to scare my brother which seemed like great fun at the time, but trick or treating was always something that we read about children in America doing and didn't happen in our little village in England. Small daughter isn't impressed with the idea of getting soaking wet to try to catch floating apples, so instead she goes out with her friends for what has become a fun evening in Winwick eating more sugar in one night than I would generally approve of. I don't mind too much - she only goes to the houses of people who are expecting her, isn't out too late and thoroughly enjoys herself, but I'm not overly enthusiastic about it all. Can you believe that it's a month since Yarndale already? Doesn't the time fly? 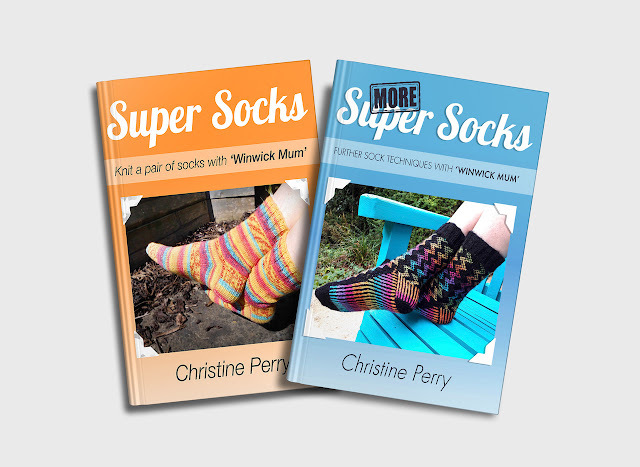 That means it's also been a month since More Super Socks was launched ... wow! A whole month! It's been a pretty amazing month and I'd like to say thank you very much everybody who's bought a copy. Spending your hard-earned cash on my book is not something that I take for granted and I am truly grateful. It really is something very special to see your book appearing in yarn shops, on websites and in social media photographs and I never get tired of the thrill of it. I've wanted to be an author from being quite small and it always seemed like something that other people did. I still can't quite believe that there are books all over the world now with my name on the cover, and most importantly, that people are able to use what's inside to knit socks and fulfil ambitions of their own. It's a kind of magic! 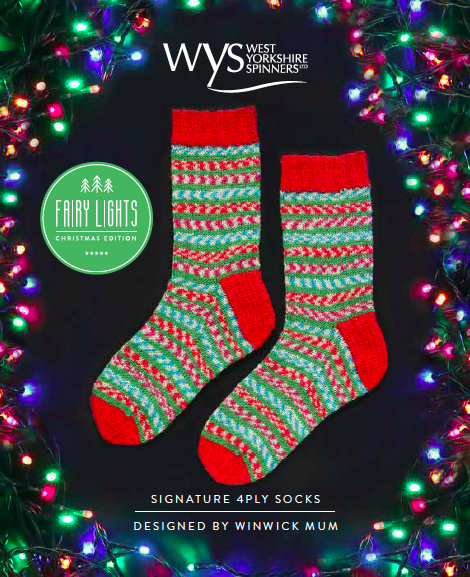 Way back in July, the nice people at WYS asked if I'd like to knit up their Christmas socks again (you may remember this pattern from last year) and of course I practically snatched their hands off. 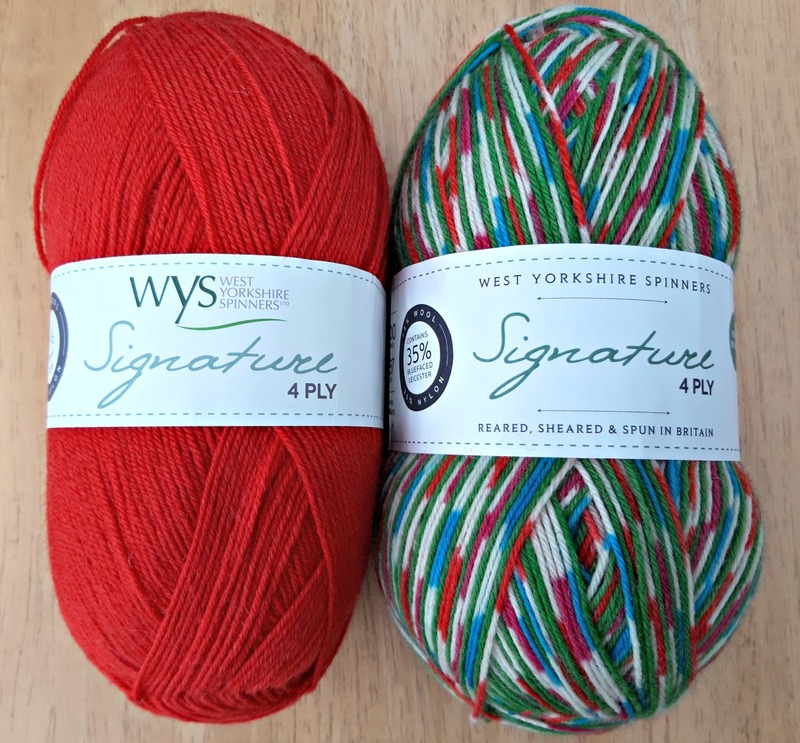 It's no secret that I love WYS Signature yarns; they're perfect for beginners, there's such a wide range of colours now and it's a good quality yarn at a good price - I couldn't wait to see what this year's festive colourway was going to look like! This is what arrived through the post. The new Christmas yarn on the right is called Fairy Lights, and the contrast yarn on the left is Cayenne Pepper - although you can also tone this yarn with Chocolate Lime, Blue Raspberry and Milk Bottle to look equally fabulous. I hadn't even seen a sneak peek of this yarn when I unpacked it and although I knew it was Christmas-themed (obviously), I couldn't begin to guess what it would look like. It's not often that you get a ball of commercially spun yarn that you have absolutely no idea what it's going to look like when it's knitted up (I'm differentiating between commercially spun and hand-dyed here as hand-dyed by it's very nature is more variable); we're so used to looking up pictures on the internet to see if we like something or not before we buy it that we don't even think twice before we do it any more. Would it be stripes like the British Birds and the Cocktail ranges? 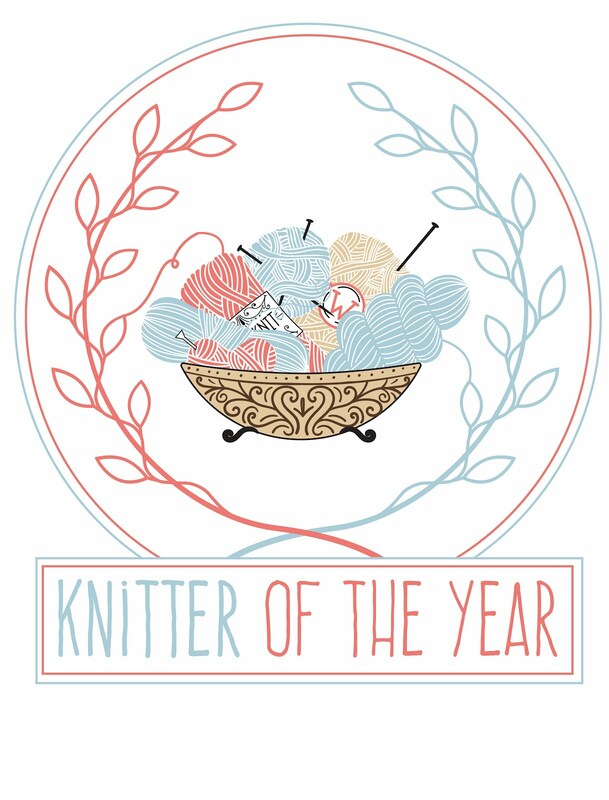 Or would it be more like the Florist yarn which knits up quite differently? You can be sure that I didn't spend too long pondering and cast on! And ... it's stripes! I think that Fairy Lights is the perfect name. You could just imagine these bands as the twinkly lights around a Christmas tree, couldn't you? Oh yarny stripes, how I love love LOVE knitting you! Better yet, festive stripes! I couldn't get enough. What do you think? I thoroughly enjoyed knitting these socks and it's always a bit of a wrench to have to hand them over to be photographed for the pattern. Oh yes, the pattern! 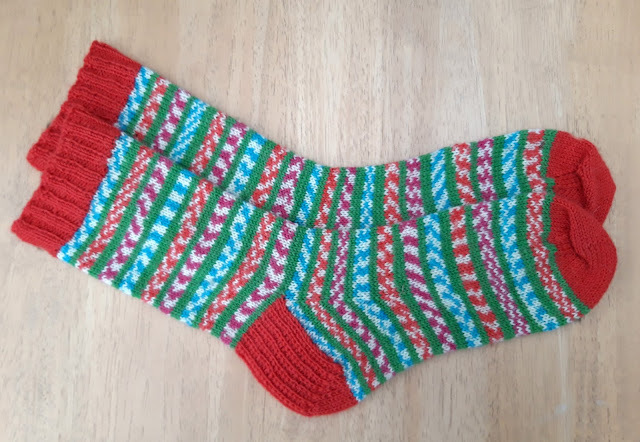 It's free with yarn purchases and is a basic sock very similar to last year's Candy Cane pattern, updated to include instructions for adding the contrast yarn. It has the ribbed heel stitch heel flap which is great if you find a regular heel flap a little tight on your foot as this one has more stretch. Candy Cane was a limited edition yarn so the pattern was limited edition too and this new version means that those who missed out on last year's pattern can still get a copy, albeit updated for this year's yarn. 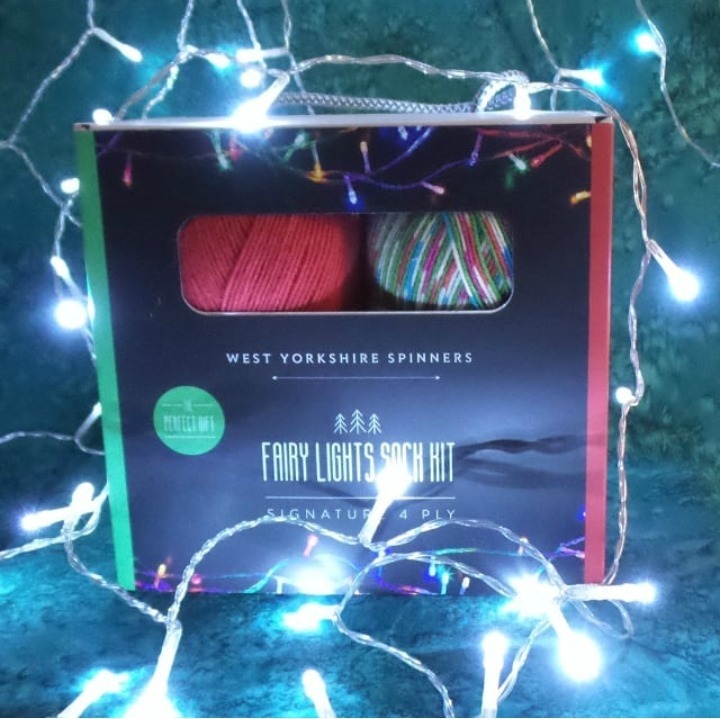 Fairy Lights is out in the yarn shops now, and available online too. 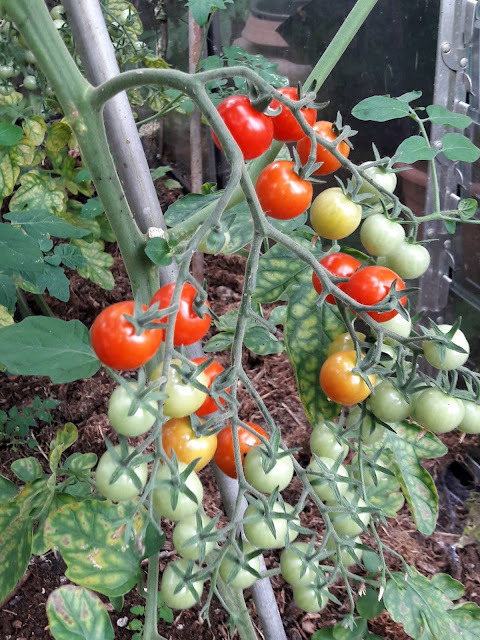 You should find it quite easily as there's plenty of it around at the moment but don't leave it too long to get some if you like the look of it as it's selling out fast! 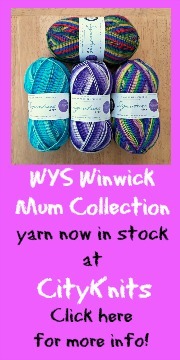 There is some available at Cityknits* at the moment if you don't have a yarn shop close to you (they are re-stocking this week as they were sold out). 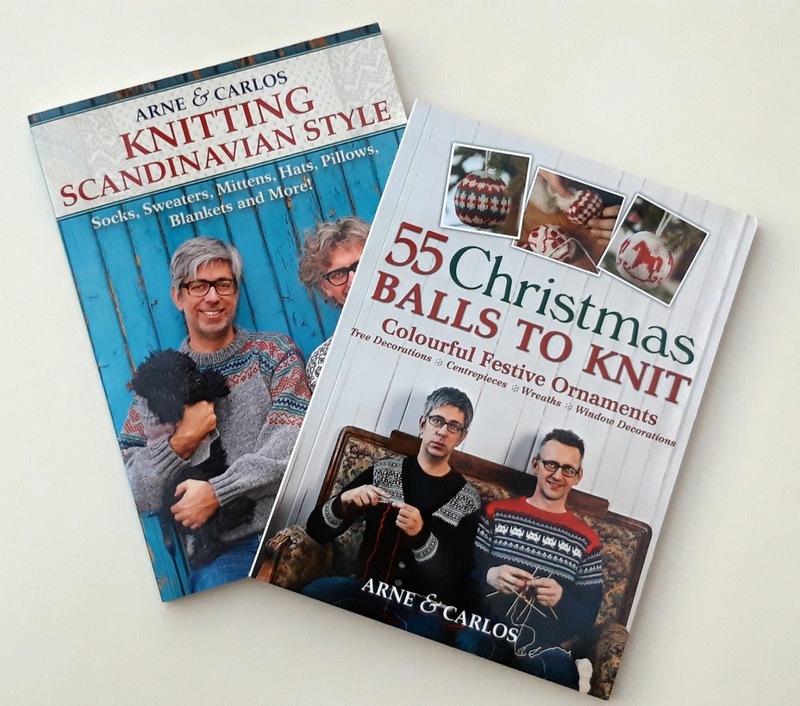 There are also gift sets available with two balls of yarn, the pattern and two gift bands in a special box which would make an idea present to give away - or keep! I haven't seen these and I know that there were only a certain number of them produced so if you want one you'll have to check with your local yarn shop quickly. 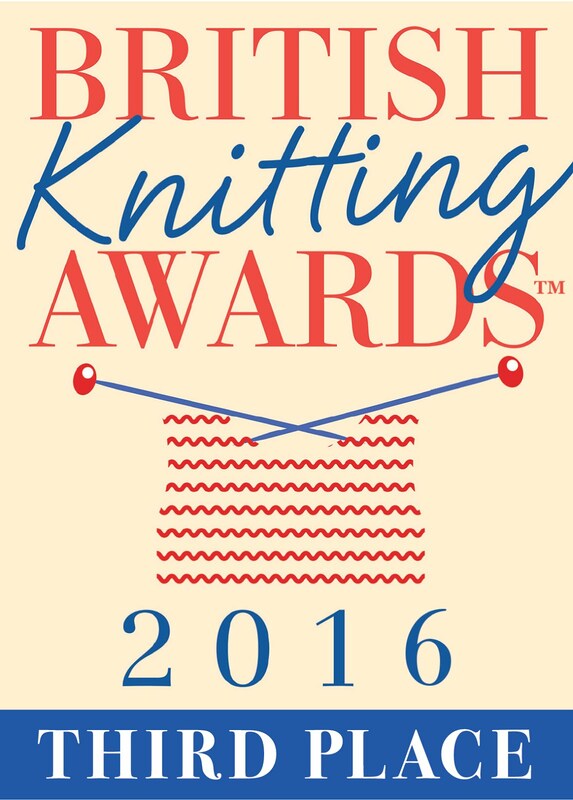 Something else with my name on ... the nomination for Knitting Blogger of the Year in the British Craft Awards. How exciting is that?! 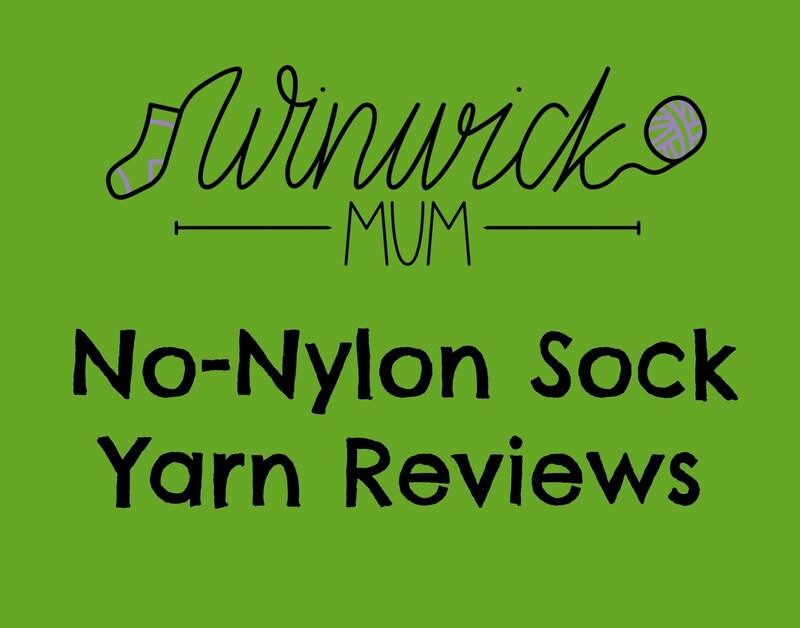 I'm absolutely delighted that Winwick Mum is being nominated for blogging awards - I do tend to be very sock-orientated in my blogging and I know that socks aren't everyone's thing so I am thrilled to be on the list with some big knitting names. It's a great honour! 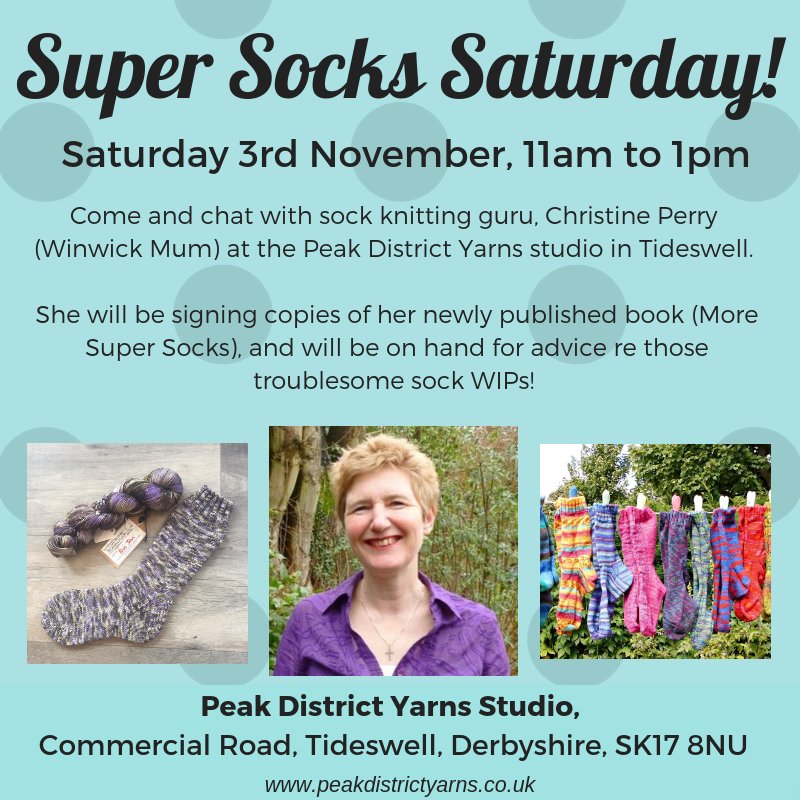 Finally ... on Saturday 3 November, I will be at Peak District Yarns Studio in Tideswell from 11am to 1pm if you can come along to say hello. 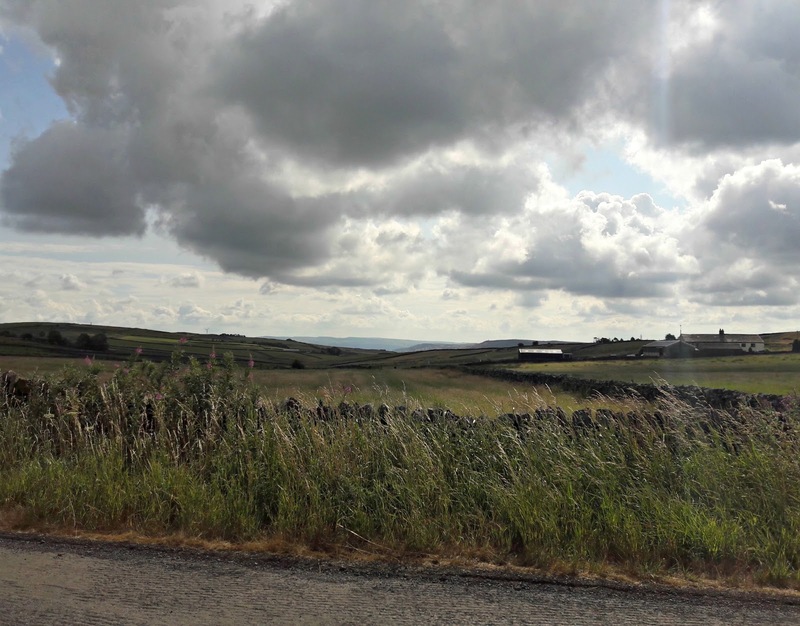 It's been quite a while since I was in the Peak District and I've not been to Tideswell since I was very small on a family holiday so I'm looking forward to it very much! I'll be signing books and also doing my usual sock clinic thing so do bring along any socks you'd like to show off (on feet or needles, I don't mind! 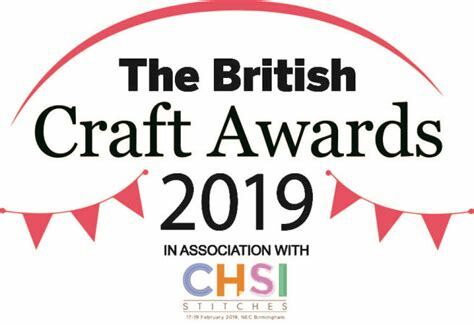 ), or if you've got questions about getting started then I'll have my sample needles for you try out circular knitting - plus Carrie at Peak District Yarns has some seriously gorgeous yarns for you to squish. She also runs dyeing workshops at her studio so if you're interested in that sort of thing then it'll be a good opportunity to come along and ask her questions too! The address is Commercial Road, Tideswell, Buxton, SK17 8NU. There's free on-street parking in the village (don't park at the pub though, they don't like it). The Facebook event page is here if it's easier for you to see details that way. Small daughter was going out for the day with her Girl Guide unit and having dropped her off at the railway station to meet the rest of the group, I was now surplus to requirements. At first, I used to worry about her going out for the day in such a big group – they usually travel by public transport and often a fair distance to water park, city museums or, in this case, Cadbury World in Birmingham (I’m not sure if I felt more sorry for the staff welcoming the group or the leader returning home with chocolate-filled girls!). However, I soon learnt that the Guide leader has absolute control over her excitable charges and yet still manages to give them the impression of having more freedom than they might usually get. It’s a skill that not everyone has, but our Guide leader has in bucketfuls. The fact that the girls adore her obviously helps, but she’s calm yet firm, relaxed yet vigilant and has a knack for surreptitious boundary-making. There's been a wild wind whipping around the house for the last two days and it's not inspired me to want to get out and about much. Winds like this make the cats go a little crazy and the dog's ears stand on end when we go out for a walk - he's not allowed off his lead as the wind affects him in strange ways too, and I'm not inclined to battle against the wind to try to find him when he disappears after smells borne tantalisingly on the gusts that he's never going to catch. 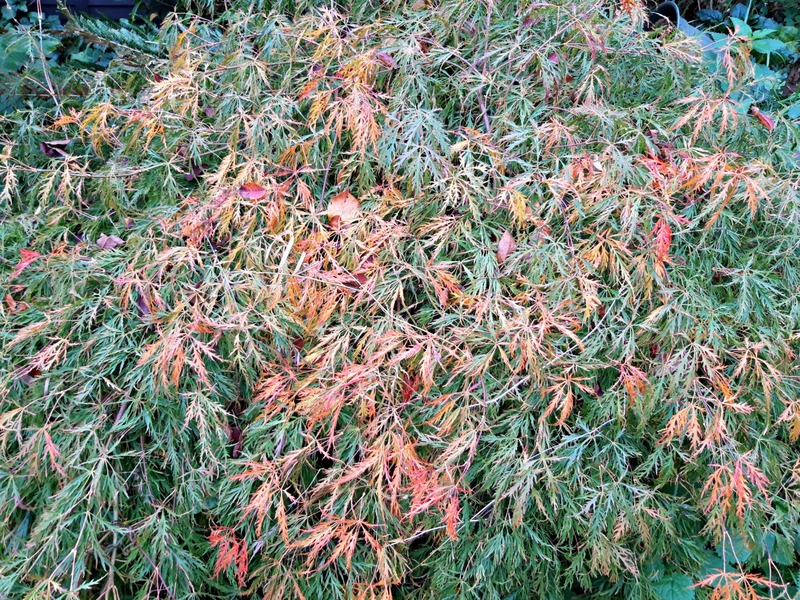 Everywhere, the leaves are turning shades of autumnal colours; yellow, orange, red, brown, they seem to be brighter this year, perhaps helped by the good weather over the summer - I'm not sure if that really affects autumn colour but the trees are looking very beautiful so I'm not complaining. 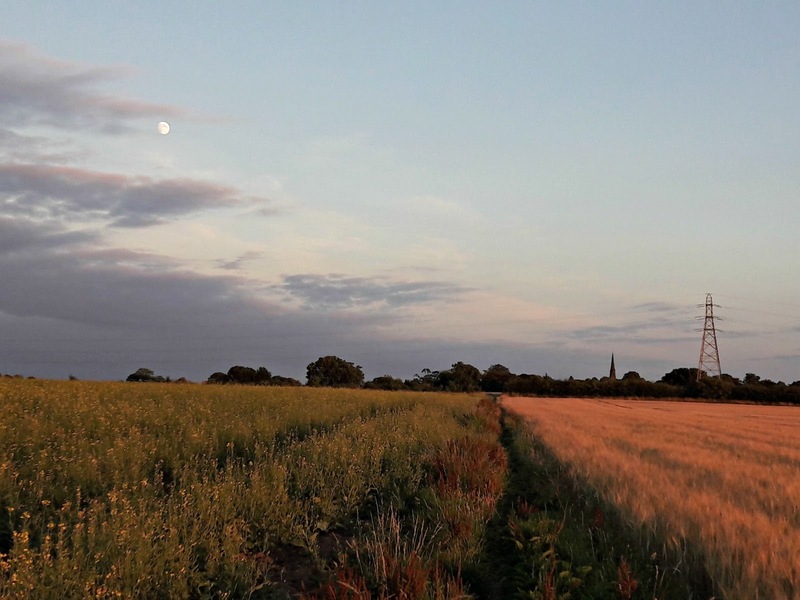 There are some people who would say that every blogger's post is self-indulgent, but today's post particularly is as I have written it knowing that I will be able to look back on in it in the future and remember - and for that I make no apology. When big daughter was very small, I retrained as a gardener and one of my first clients was a lovely lady who had an equally lovely and very large Victorian walled garden. Fifteen years later, the lady has sold her house and is moving on, and today was my last visit to the walled garden when I have spent very many hours in all kinds of weather. We always knew this day was coming and it's absolutely the right thing for her to be doing, but it's still sad to know that the season has changed and something has come to an end. Yarndale 2018 - my favourite yarny weekend! Two weeks ago, I drove up to Skipton to help set up for the 6th annual Yarndale festival. 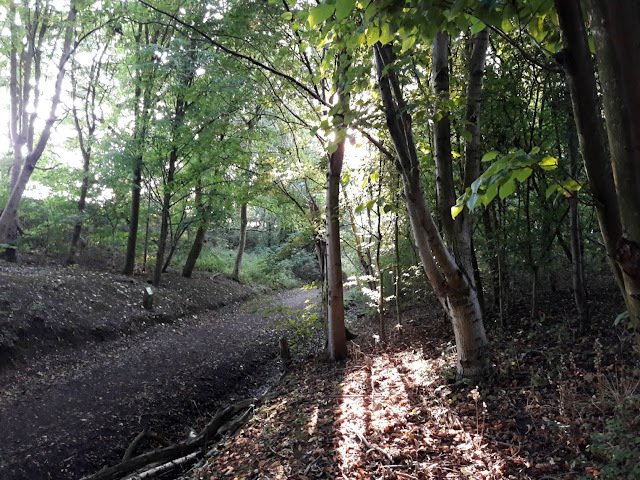 It was a gloriously sunny day for late September - I think someone at Yarndale has a magic weather wand as the weather has always been nicer than you might expect - and I sang at the top of my voice in the car all the way. 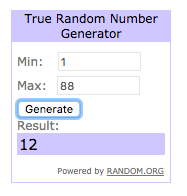 Thank very much to everyone who left a comment in the More Super Socks giveaway - I'm a bit later in posting the results of the draw than I intended to be but they're here now. Congratulations! If you can drop me an email with your address then I'll get your book out to you straight away. I'd also like to say a huge thank you to everyone who has been so supportive of my new book whether in your words or whether you've bought it. 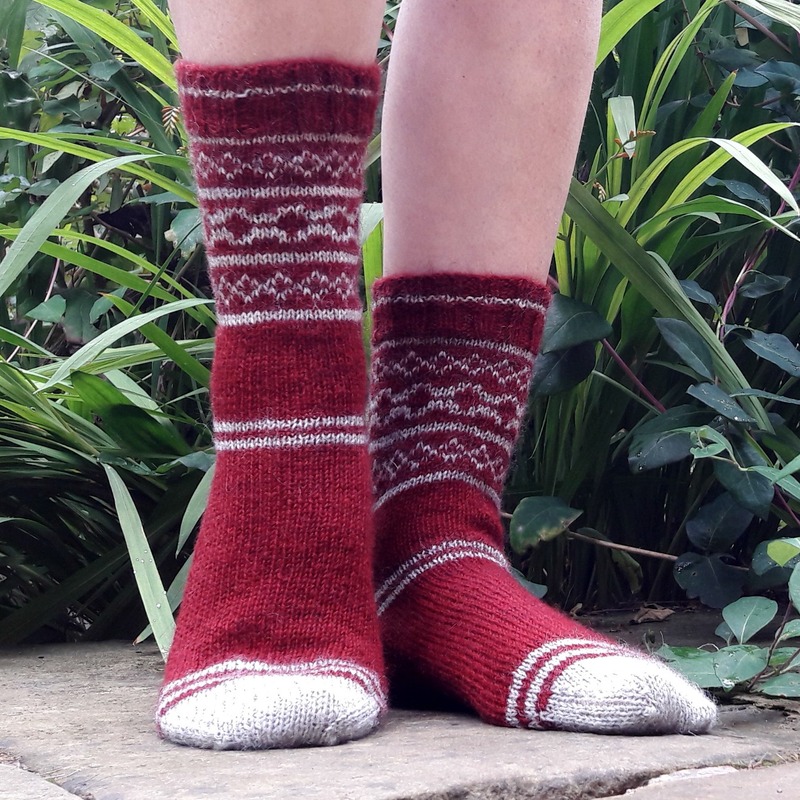 I loved meeting everyone who came to see me at Yarndale - it was super-busy and I do appreciate the time that people spent waiting to talk to me and show off your socks. I'll be writing a post about Yarndale very soon - I think it's taken me the best part of the week to unpack and recover from all the book and Yarndale excitement! More Super Socks release day! Oh wow, what an exciting day this is! 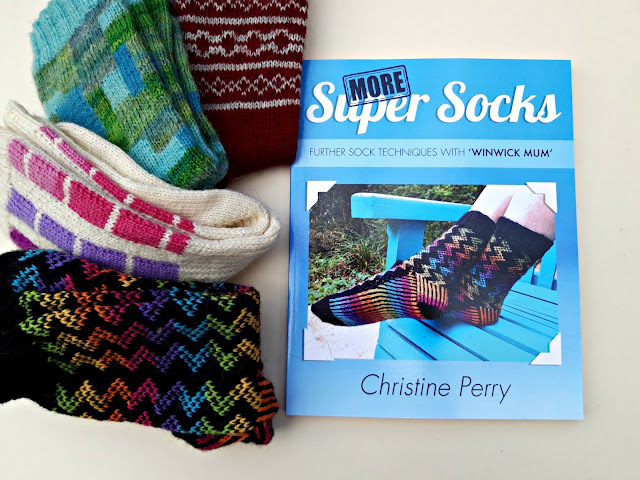 My second sock-knitting book, More Super Socks, is released today and I am thrilled to see it finally leave the confines of my computer screen and go out into the world! 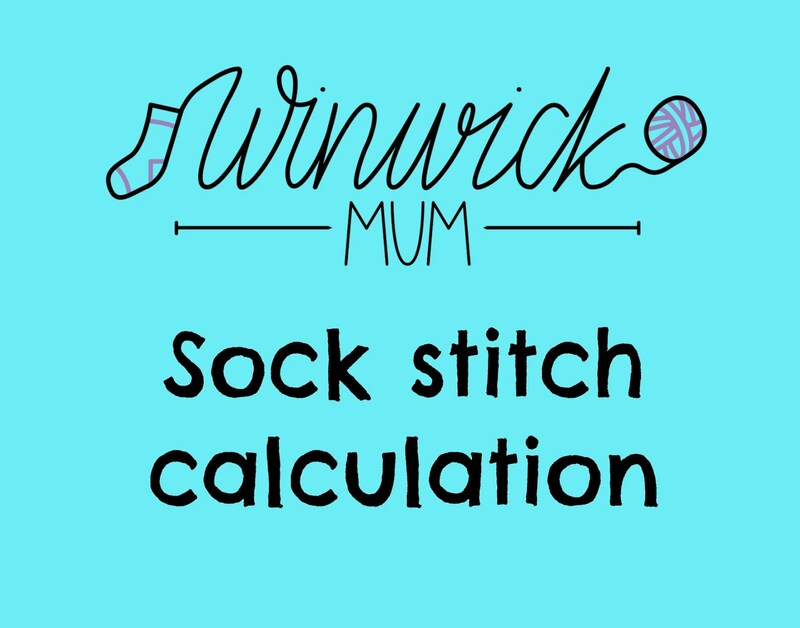 It's written to be the next step on from Super Socks and takes you through adding cables, lace, intarsia and colourwork to your socks. Four brand new patterns will help you to practice the techniques that you learn in the book. You can take a tour of the book and see all the patterns inside here. What do you think? Would you like a copy? Here's how you can get one! Click on this link HERE to buy a signed copy through the blog. I'll post to anywhere in the world, but please be sure to choose your correct postal country from the drop down list as PayPal won't calculate the postage for you. If you're using an iPad or iPhone, you'll need to email me for an invoice as there's a PayPal issue with these Apple devices. Don't forget that I'm at Yarndale this weekend so I'll send them as soon as I get a minute! 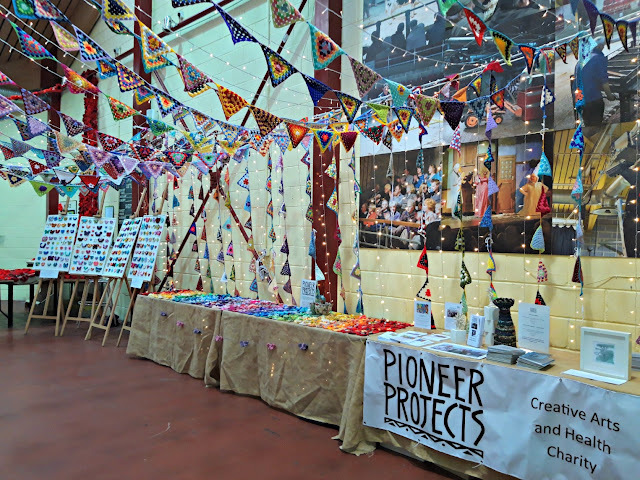 It seemed like an age away only a few short months ago, but Yarndale weekend is finally here! It's one of those occasions that feels like a roller coaster clattering up the steep slope ready for the moment when the cars reach the top and glide down again at an unstoppable speed. 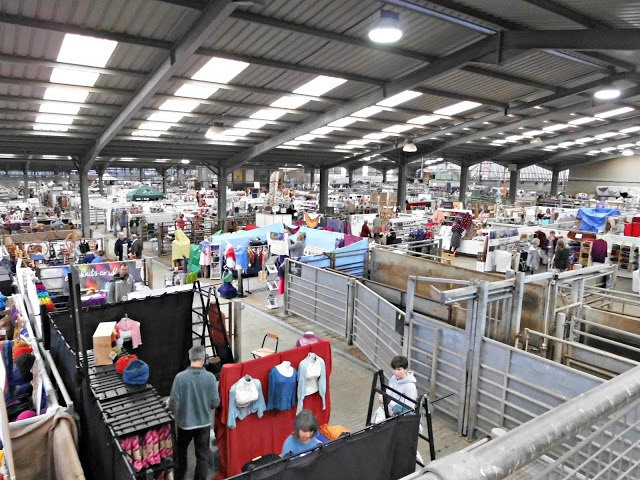 I love the setting-up day when the Mart is full of bustle, noise and anticipation, and of course I love the Yarndale days too when the bustle, noise and anticipation levels swell immensely to fill the whole building with yarny happiness. 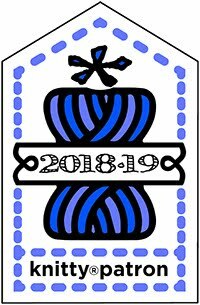 The Yarndale Sock Line will look a little different this year in our new space but I am very confident that it's still going to look fabulous. The lighting is much better this year too, so you should get a good view of all the beautifully coloured yarns and all that socky love. If you're coming to pick up a pre-ordered copy of More Super Socks, please remember to bring your PayPal receipt so that I can match you up with the copies that I've set aside. Hi there! I'm really glad to see that I didn't scare you off yesterday with all this talk of colourwork knitting, so let's get started with this new pair of socks. Before we start, I need to warn you that there are lots of photos in this tutorial, plus video links! 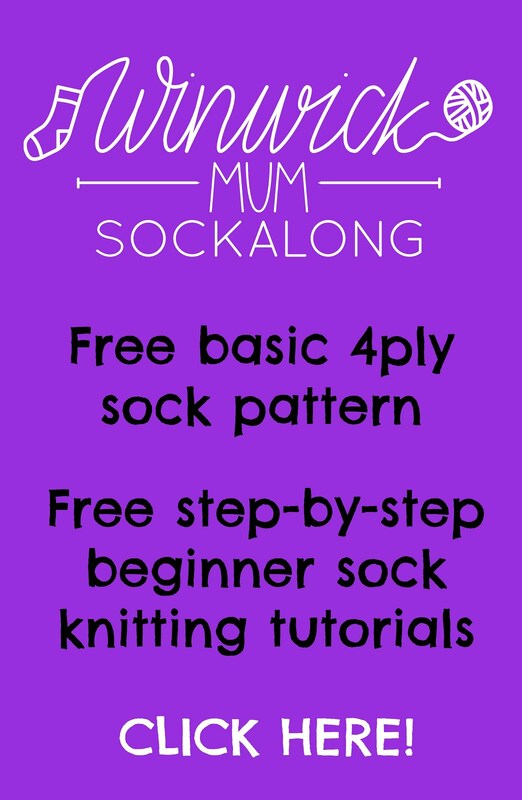 This post follows on from yesterday's getting started post (which you can find here if you missed it) where I talked about the socks and tried to answer some of the questions you might have. Have you ever looked at patterns knitted in two or more colours and thought they would be fabulous for socks? It seems that more and more these days, colourwork is an integral part of pattern design and it's not really as hard to do as you might think. 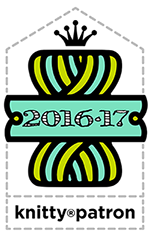 to pattern books encouraging you to develop your own style, it seems that colourwork is everywhere. 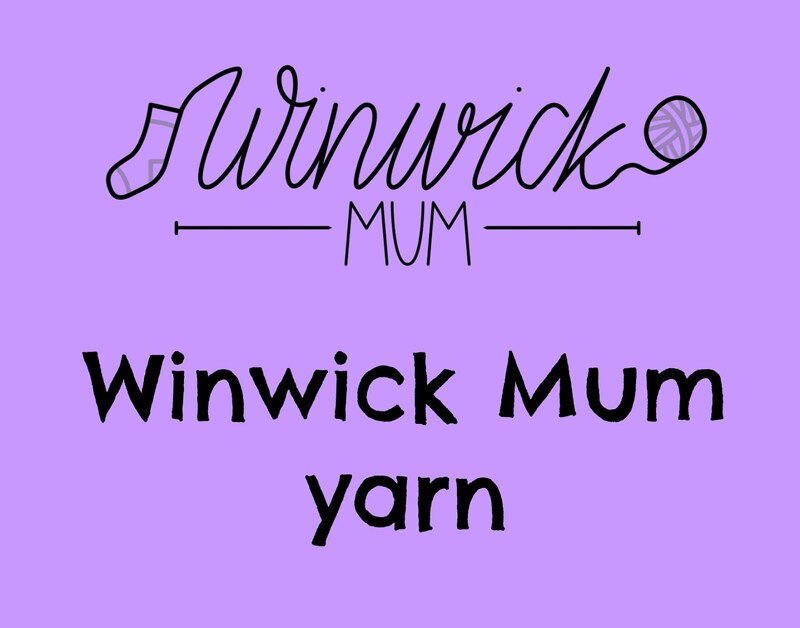 With less than a week to go before Yarndale, I'd love to tell you that everything's all ready here at Winwick Mum HQ and I'm putting my feet up before a wonderfully busy, yarny weekend. However, I am well-practised at the last-minute-fly-by-the-seat-of-your-pants type of preparation (and not just for Yarndale - this technique works well for Christmas too!) and this week is one giant to-do list that I am slowly but surely working my way through. 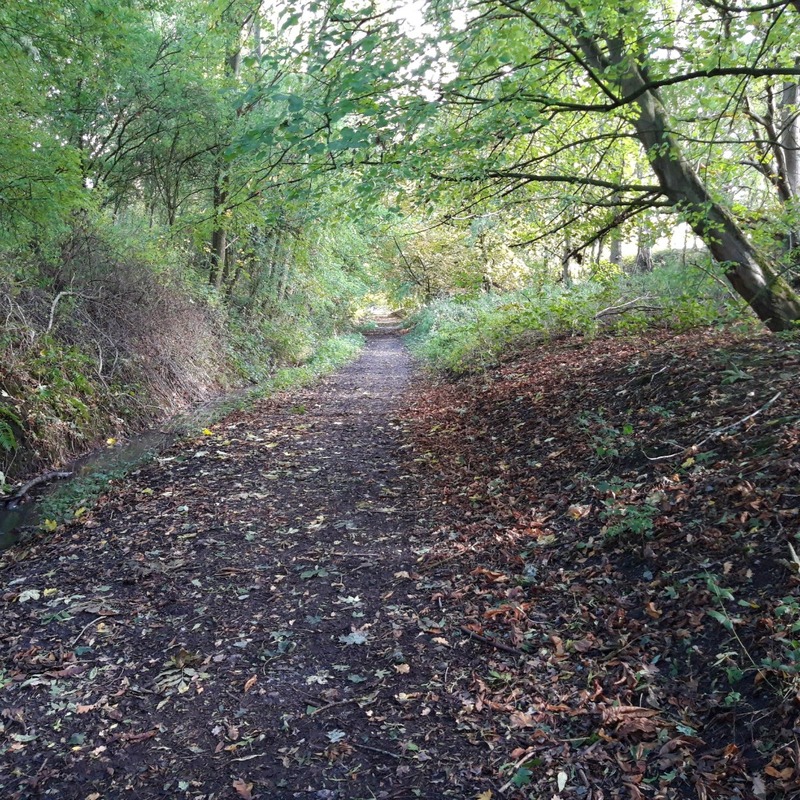 What I have been doing this week is making sure that I get out with the dog for a decent walk every day. It's been so tempting to skip it, to just take a few brisk laps of the village instead so that I can get back to The List, but I know that taking that hour out to give him a proper run will make all the difference. By the time we get home, I'm all fired up from striding out and getting some speed up (it's all very well taking time out but I've got a list of jobs to do, don't you know?! ), the dog's a happy boy because he loves these muddy woods and I've made some sense of the order of my list in my head. It's like magic. 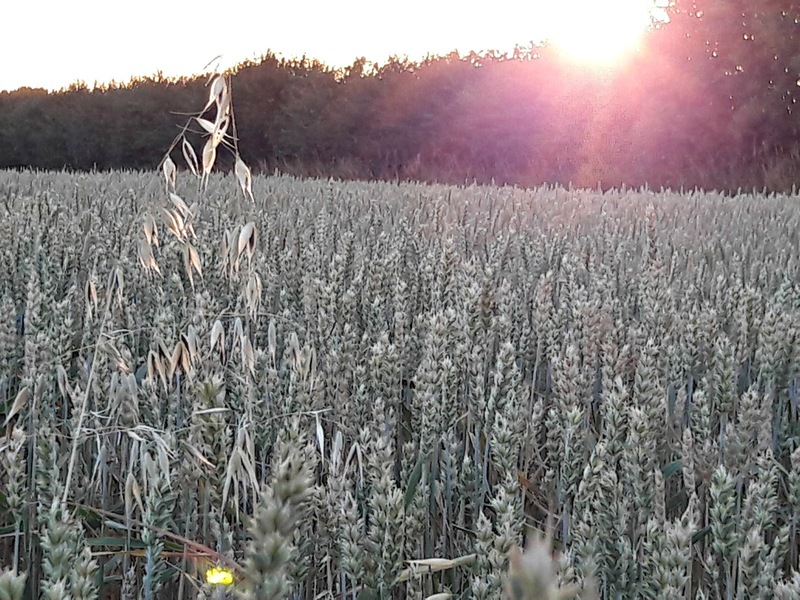 Fresh air really is magic, and it's free. Hello, I'm still here! Just three weeks to go till Yarndale now and I'm going as fast as I can to get All The Jobs done beforehand! First of all, though, I want to say thank you very much to everyone who has pre-ordered a copy of More Super Socks to pick up at Yarndale. I'm really looking forward to seeing you all there! If you missed last week's post and you're coming to Yarndale, you can find the pre-order post here and the post about More Super Socks and what's inside here. I'm super-excited to think that it's only three weeks till the book launch! Now, though, let me tell you about what's been keeping me busy this week: the Yarndale Sock Line Socks! I'm so glad to finally have these now that I've been up to see Lucy, and thank you so much to everyone who has sent socks in to me. 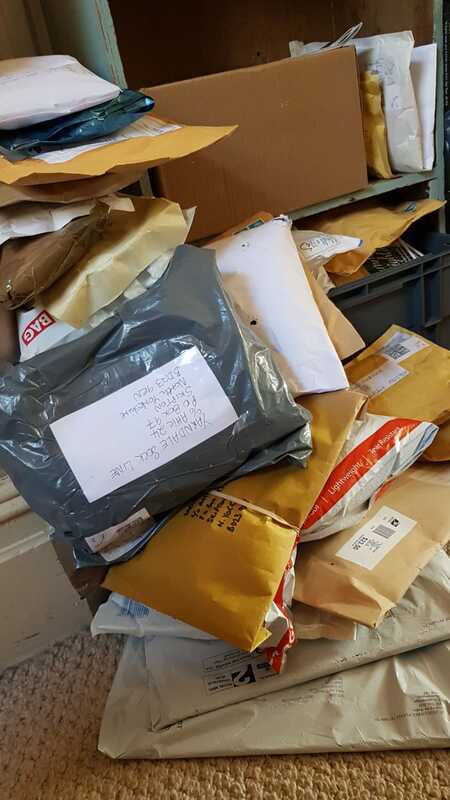 I can't tell you how lovely it is to see such a huge pile of parcels and know that each one contains a gift for a stranger who needs some woolly love. 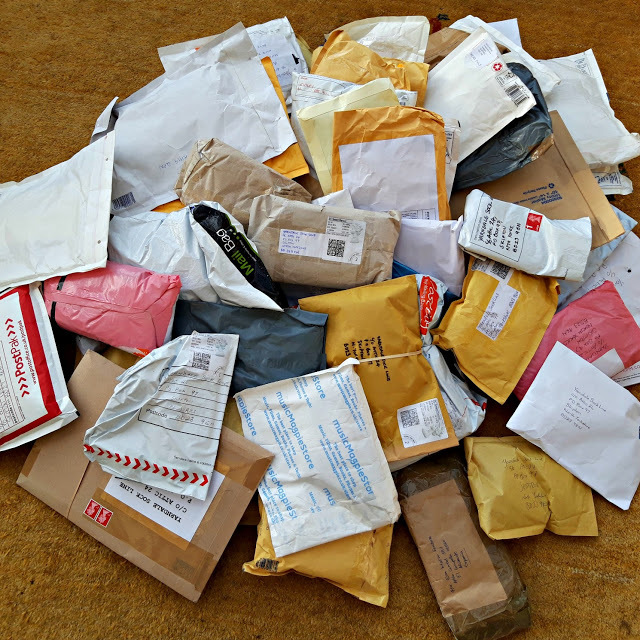 This is just a small selection of them - there was a bin bag full plus another box - it was amazing! Today is the day that the pre-orders open for collection at the Yarndale festival in Skipton at the end of September. If you missed the tour of the book patterns so that you can see what's inside the book, you can find that post here. Is there a particular reason why I'm doing this? Yes, there is. There are a couple, in fact: firstly, I have no idea how many people will want a copy of this book and I don't want anyone to be disappointed if they've travelled all the way to Yarndale only to find that I didn't bring enough copies with me. 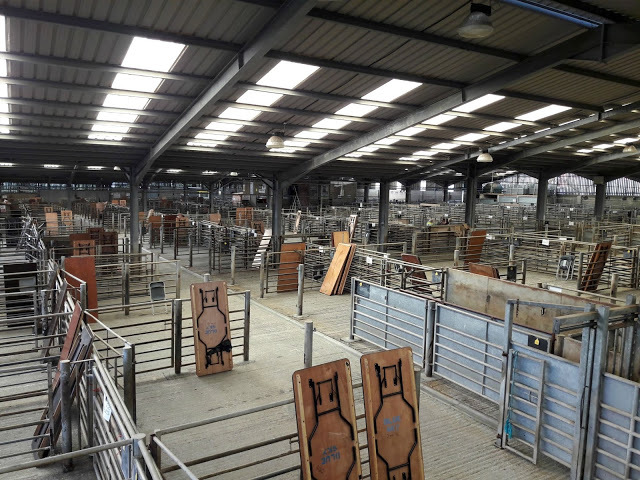 Secondly, if you've been to Yarndale before then you'll know that the floors are uneven in places and all of the stands are in rows of animal pens. The Knit n Natter lounge where I will be with Lucy of Attic24 again is right in the middle of the Auction Mart and I don't want anyone to think that they have to rush to find me in case the book sells out; if you already have a copy reserved then I'll keep it safe until you come to pick it up. Hello! 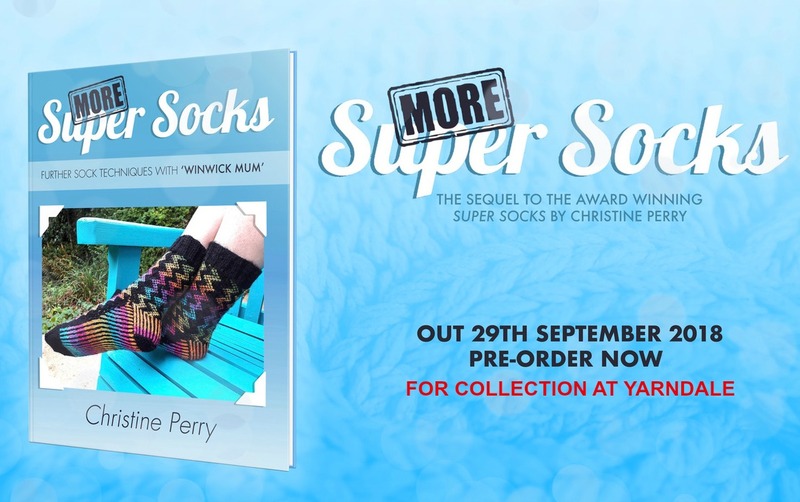 I promised to tell you more about my new book, More Super Socks, and today's the day. I am so excited to show you what this book is about! Well, here it is. Introducing ... More Super Socks. 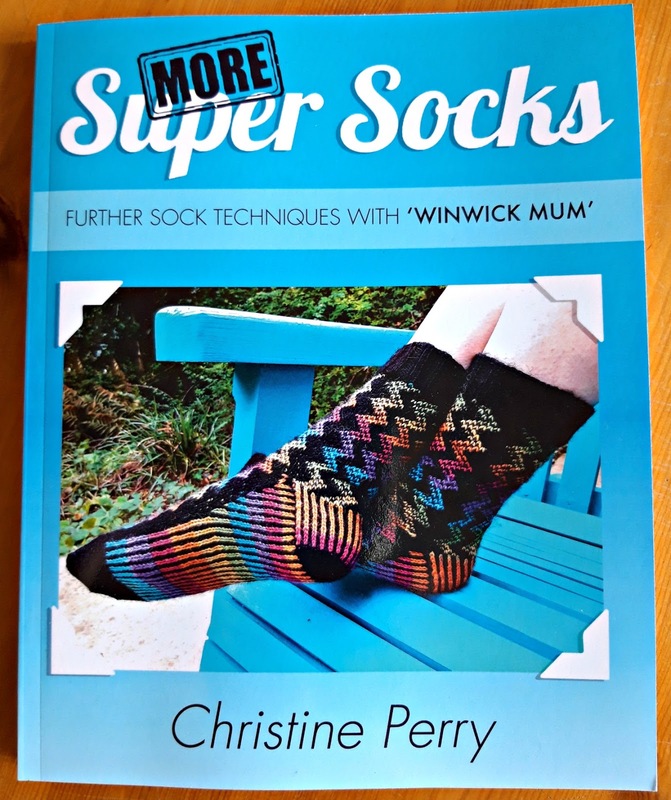 The idea behind this book is that it helps to bridge the gap between knitting the basic Sockalong sock that's in the Winwick Mum Sockalong tutorials and the first Super Socks book, and knitting other patterns that are more complicated. For some people, that jump is an easy one after learning how a sock is constructed, but for other people it still seems like a jump too far. It's only the same as being someone who likes to leap straight into a swimming pool from the side or getting in down the steps. Either way, you still end up in the water! Helloo! How are you doing? Thanks for all your lovely comments on my last post - I've not been so good at replying to them all over the holidays but I will catch up soon! 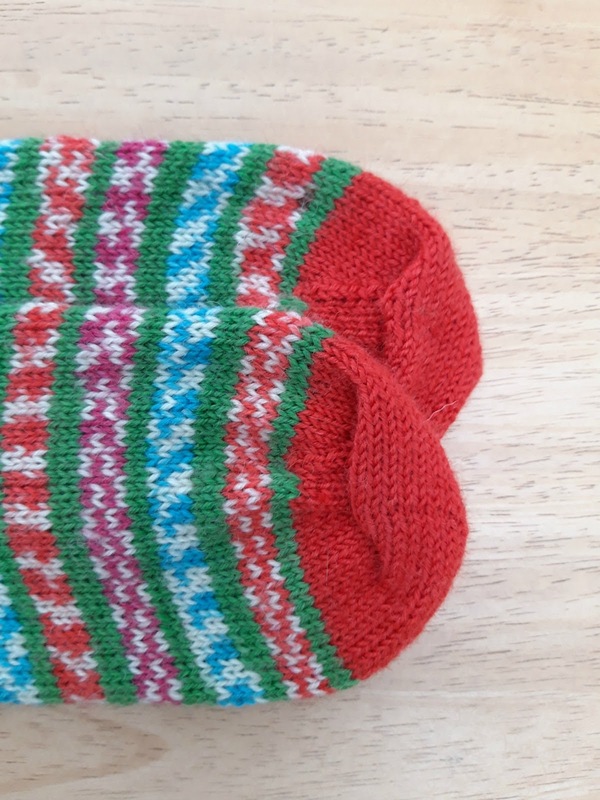 It's been quite a while since I wrote a post that was about nothing but socks - but here it is! 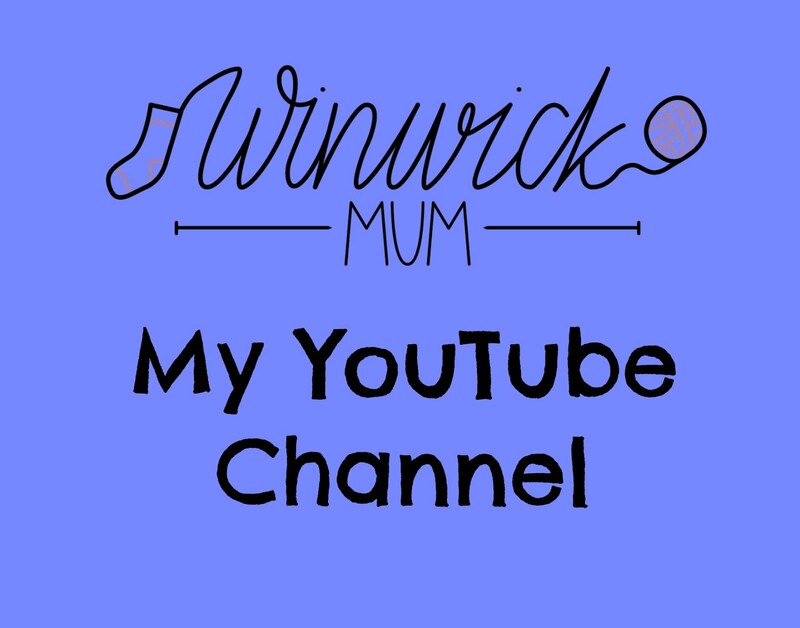 I've got plenty to tell you about yarns and knitted socks, so get yourself a brew and let's get started! 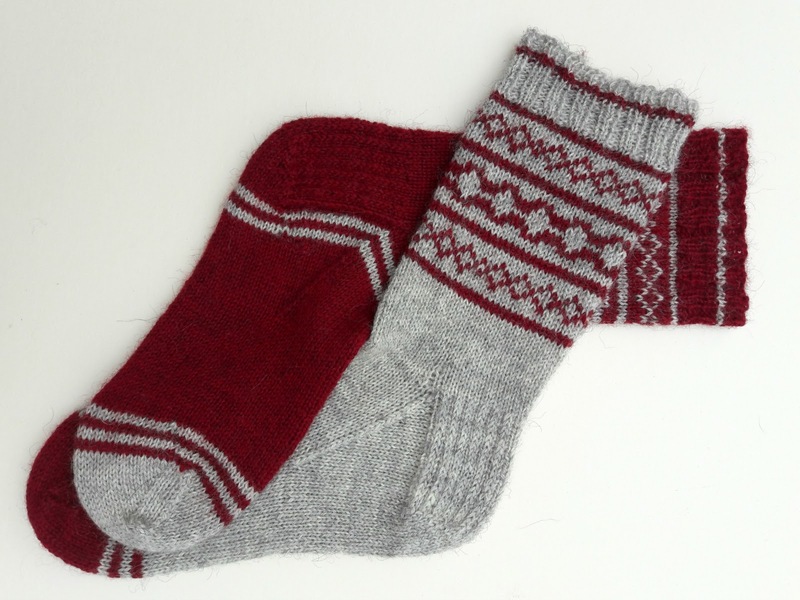 Here are the latest Yarndale Sock Line parcels. If you've missed the post from earlier this year, you can find out all about the Sock Line here. 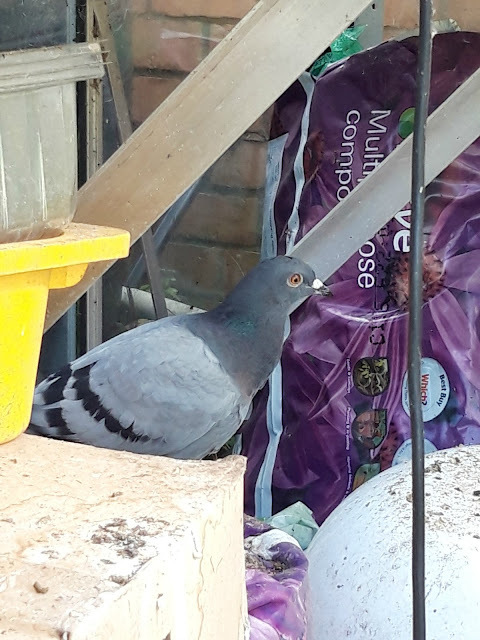 They've been coming in thick and fast and there are so many of them - and they're all still in Yorkshire with Lucy! Oh these school holidays, they do get in the way sometimes :) Routines go completely out of the window, don't they, and Lucy and I haven't had chance to catch up with each other since before the schools broke up. I'm regretting leaving that bag-full in her studio the last time I saw her as at least I'd have some socks to show you, but it is how it is, as someone once said to me (he was a builder, so imagine saying it whilst shaking your head, drinking very strong tea and explaining why your house extension was running three weeks late). However, it's a useful phrase to remind you that not everything is in your control and I seem to have been saying it a lot just lately! It's very different to Granada, as you'd expect. 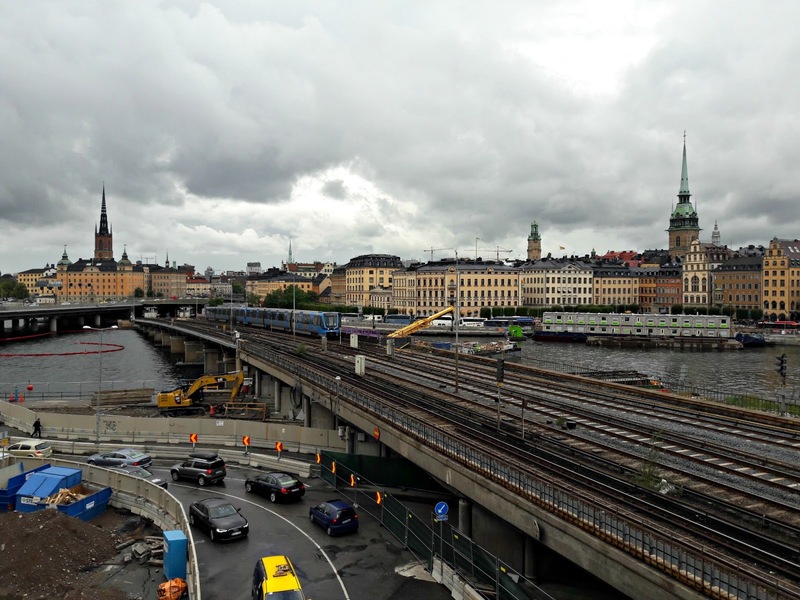 We were in a capital city, after all, so in lots of ways it was much more like London with it's public transport system, banking district and shopping areas. In hindsight, it wasn't the best place to go for a restful week in August, especially as when there's something to be seen then we like to see it, but Stockholm has been on our list of places to visit for a long time so we knew that we wanted to go when we were planning our holidays at the beginning of the year. We went on the sightseeing bus tour on our first morning - always our first port of call in a new city as it gives us a good overview of what's there and what we want to go back to see. Small daughter came back from a week at an international Scout and Guide camp on Saturday, and I seem to have been washing and ironing ever since. She only took one rucksack but I think we must have managed to stuff enough clothes into it for a six month backpacking trip! It's usually easier for my schedule to walk the dog earlier in the day but recently we've been heading out in the evening instead. I'd forgotten just how nice it is to see the sun setting across the fields and through the trees, and as the days have been a little cooler it's been more pleasant for the dog as well. We've had the rain recently; heavy heavy showers that have filled up the water barrels to overflowing and made the grass green again. It's still warm though, and we're appreciating not having to take extra layers out with us in the evenings. Slow summer days and long summer evenings. We've been very spoilt this year. All year we've been working our way step by step out along the diving board until now - with the last day of school finally here - we're ready to make the leap and plunge into the summer holidays. It seems quite incredible that a whole school year is over! On the one hand, I am so ready (and so is small daughter) to take a break from the early mornings, the reminders to take a waterproof now that the rain has returned, the constant "have you got your homework - wait, have you done your homework?" questions and the obligation to wear school uniform every day and I'm very much looking forward to having both my girls around all the time, but on the other hand a small part of me is rather worried about whether I'm going to get anything remotely work-like done over the holidays. I think the word "Mum" (in our house it's pronounced "Mu-u-um") is used just to break the silence in our house sometimes, but sadly it breaks my concentration as well although often I do get a get a brew out of it (big daughter has just come to talk to me whilst I'm writing this and we're laughing as I'm disturbed yet again, although she is brewing up so I'll forgive her :) ) I think the plan will be to get up early as that's something that neither of the girls tend to do - or to take myself out of the way, but more of that later! I've been trying to pack in all of those jobs that are best done before school holidays. Last week I went to Skipton to see Lucy and to pick up the Yarndale Sock Line socks.